If someone asked you what your biggest clutter complaint might be, I bet more of you would say paper clutter more than any other. Why? Because paper is always coming into our homes. 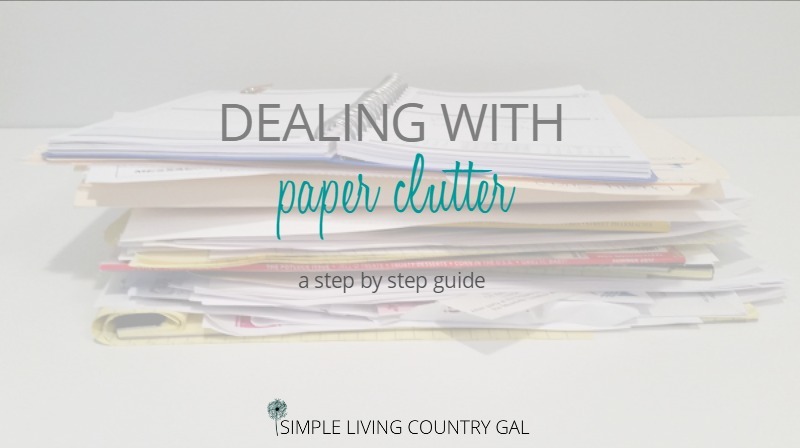 This post will help you when you are drowning in paper and paper clutter. I mean even is this age of technology and innovation, the paper is still coming. Day after day. Mail, school papers, newspapers, magazines, coupons, oh and let’s not forget all the things you print from your computer. So many things that come into your home every day. The problem is, most of the paper cannot be thrown away. So what do you do? You toss it in a pile telling yourself you will look at later. After a few days that one pile has toppled over and is now two piles. Then mysteriously that pile spreads like a weed. Soon you have a pile in the family room, the nite stand next to your bed, the kitchen counter and in your office. You may even find a pile in your car if you are anything like my boys. 🙂 Important papers get buried, only to become lost and forgotten. Important papers get buried, only to become lost and forgotten. I am sure we have all been there. We need a system. A paper control system that will ensure that every single piece of paper that comes into your home gets in the proper place so the appropriate attention can be paid. I am not telling you to immediately take the electric bill as soon as it arrives in the office to write a check and mail it. I am saying you need a landing place for each paper so you know when you pay your bills for the week the electric bill will be there and will actually get paid on time. When creating systems, you need to think of HOW you do things and WHERE you do them. Keep things simple and streamlined so you save time and effort. If you make things complicated trust me, you will not do it. I have been there, the more steps something requires to complete the less likely I am to stick with it. I have read many articles on file folders in portable containers for mail and pretty boxes to put bills in. That to me is just too much work. Too many steps. Instead, use a drawer or basket. Simple. Easy. Effective. Those are the keys to a good working system. Setting up a paper system to control and deal with paper clutter. Gather your papers. Take a clothes basket and walk around your home. 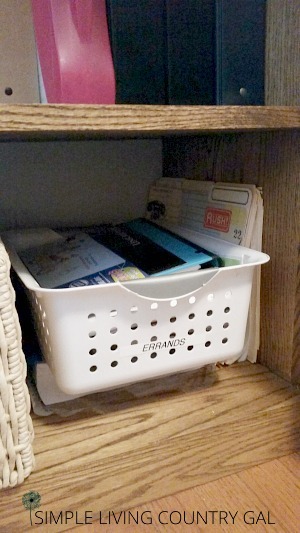 Put any papers you find in your basket and continue until you have them all. There is no sense doing this twice kids! Label. Just take a post-it note and label each pile so you don’t forget what is what. Assign a zone to each pile. If you do not have a designated area for each zone, this part may take a bit. The easiest way to do this is to think….where should I keep these papers that make the most sense. [spacer height=”20px”]When the time comes for you to find your coupons for example, where would you be more likely to look? I have found that the place where I like to do a certain task is a good place to house the appropriate papers. Designate a drop area for each zone. Depending on your zone location you may use a basket, bin or even a drawer. The point is to choose something that is simple and easy. Remember to keep it silly simple so you actually USE it. For my coupons, I like to have a basket. A quick and easy catch-all for any type of coupon. Drop and go. To keep this process from becoming too overwhelming I would just put your paper pile in your drop area and move on to the next pile. You can deal with the paper when you are in your zone. To do it all in one day is too much. Remember baby steps are key to keeping large jobs more manageable. Create a routine. This step is very important when dealing with paper clutter. Sure you can set up zones and find pretty baskets but if you forget to visit each zone weekly, you no longer have a system. You instead have a new place to put your piles. What you need to do is make a weekly schedule that will give attention to each zone. I would give a day to each zone and plan on about 30-45 minutes the very first time you do it. Remember you will have that initial pile to sort through. Then after, you should only need about 10-15 minutes which is much more manageable. I am a visual person so I need to get things down on paper. I will choose a day for each zone and write it on a piece of paper. When finished, place your paper in a page protector and set aside. As with any new routine, I like to set my alarm on my Fitbit or cell phone. Having a gentle reminder will be so helpful until your new routine is a full habit. Put your list/routine where you will see it. In our home, all paper sorting seems to happen in the kitchen. For this reason, I kept my list/routine sheet in a drawer in my kitchen. Zone ideas to better deal when you are drowning in paper clutter. Bill paying zone. I find a drawer works best for this. 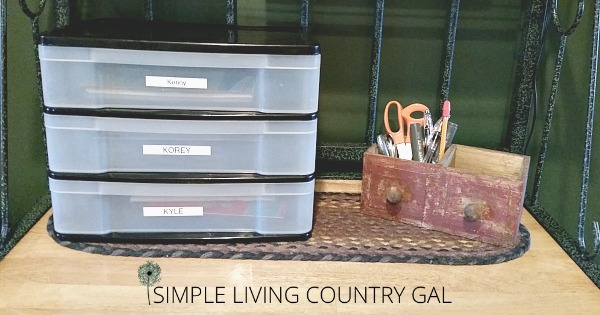 Keep all your bill paying supplies in here and simply put new bills or money information in the drawer. Pay bills weekly to ensure you are always on time. Once a bill is paid file either by month or by type and keep the current year only. At the end of the year, all receipts and bills should be kept in a dated year bundle for the appropriate time frame. Coupon zone. A basket may work better here. That way you can grab your basket and take it with you. Coupons, pen, scissors, a pad of paper for your list, price book all go in your basket. This will make errand list time a breeze! Spouse’s mail. Handyman hubby has a basket where I toss not only his mail but also his “honey-do” list or items I want to talk to him about. Hubs will go through his basket twice a week. Reading bag. Last Christmas my sister-in-law made me this adorable little bag. I use it to put any magazines or other items I want to read or look at. I also have a small notebook and pen. 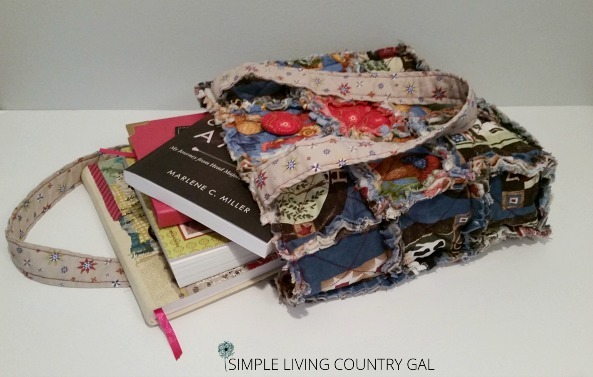 When I have a few minutes to myself I will grab my reading bag and find something to relax with. I just love my reading bag and I am always finding excuses to grab it. Kids papers. When our children were younger, our kitchen was like grand central station. For that reason, I created a command center. On it I had a set of drawers that I labeled with each of my boy’s names. Inside is where I would house any permission slips, lunch money, or signed papers for school. The boys new to check their drawers each morning before they left for school and each evening before dinner. This ensured that nothing was ever forgotten. Correspondence and miscellaneous. In my planner, I have a pouch where I keep all of these items. Since most correspondence comes with a date having it next to my calendar ensures it gets written down and will not be forgotten. Recipes. For some reason one of the most common things I find myself printing are recipes. I used to keep them in binders organized by meal, but I soon found my family would eat the same things over and over. finally, I only kept the recipes my family truly loved and would change them up to keep things from getting boring. I now keep recipes in a folder in my planner. When I do our family meal plan for the week, the recipes are all right there to make things quick and easy to do. Ninja tip: I like to make notes on my recipes. What my family thought and ideas for variations. Put your new system into action! As paper comes into your home sorting through it right away saves a load of time. Toss the junk and put the rest into your zone piles using your sheet as a reference. Walk around your home putting your piles into their proper zones. That’s it! Easy, right? Now if you see a paper that needs immediate attention, then deal immediately. The rest can wait until you are in that zone depending on your schedule. Follow these silly simple tips and your paper clutter worries will be over forever. B. I love when peoplecan be that organized, while it is a systwm I personally will never spend my time that way. 3. Bills in a drawer? Out of sight, our of mind, eso when vehiclw registration renewals sent way too far 8n advance! I need help with recycling. Paper bagsfilled with boxes and other bags and they come only 2x a month.can’t contain it…. As far as recycling, we have a box we keep paper items in that do not need shredding. Those get taking to the recycling center monthly. As far as paper items that need shredding (aka torn in a few pieces) I burn those in our burn bin. Now I realize not every has this option but this is how we do it. If not you may want to invest in a shredder to ensure your privacy is safe before recycling it. I also live with a clutter bug, so dealing with paper weekly is essential for us to keep it from piling up. I find with the bills I put them in my big diary planner when I need to pay them put info on page & receipt number when paid i put them in the file under appropriate title that way i have record in 2 places in diary & file. i check my diary every day so dont miss when due. I love this tip, Beth! What do you do with bills once they are paid? 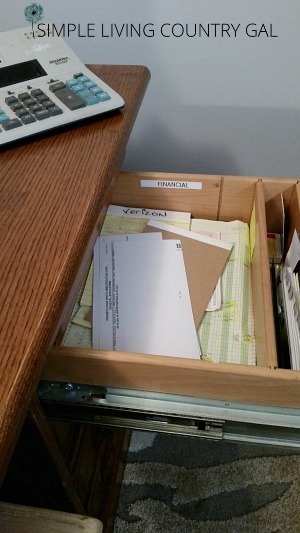 I like to keep paid bills filed for the current year in my desk for easy access. At the end of each year, all receipts and other paperwork are bundled and dated and kept for the suggested time. THANK YOU FOR THIS ARTICLE! I’M TRYING TO GET IT ALL IN ORDER AND DECLUTTER MY PAPER. I HAVE A FEW THINGS I DO THAT HELPS me. I have a small box in my kitchen where I drop all of my receipts for purchases. Every week, I input this into an EXCEL file for my taxes. It also helps me see where my money is being spent. Some banks offer a similar program, but my bank recently went to an outside source for this and I don’t want an outside source having my banking info! So now I do it myself. I also have a roller that makes it impossible to read addresses. This is a security measure, so someone doesn’t get my info and use it. Everything that isn’t burnable/shredable gets this used on it and taken to my local dump (or you could just throw it for the garbage service). I only shred the paper that is compostable, IE: not shiny. Shiny paper has unwanted things in it that you don’t want on your plants. I either use it for mulch, compost it or burn it, I need to clear out my paper that I have kept for 20 years for taxes (in case of an audit….I only need 7 years back, but I’ll probably keep 10!) I do use piles, but this can get messy, too. So I’ll try out some of your suggestions! Thanks again! Welcome, I hope these tips help you out. Thank you for sharing what works for you, these are great ideas!